Tijdens de afgelopen Grand Prix van Monaco heeft prins Albert II van Monaco met de volledig elektrische Venturi Volage op het geprepareerde circuit gereden. De Volage is in een samenwerkingsverband tussen het Franse Venturi en Michelin ontwikkeld. De Volage van Venturi maakt gebruik van de ‘Active Wheel’ -aandrijving van Michelin. The Prince of Wales – Wine rides so fine ! 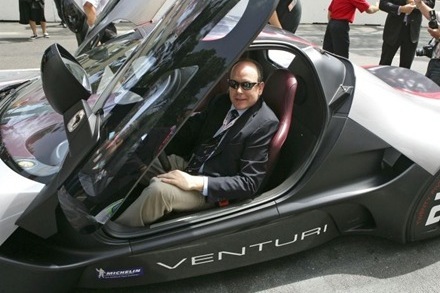 The Renault-Nissan Alliance will be supplying zero emission vehicles to Monaco from 2011. After this time the Government will require 50% of newly purchased public fleet vehicles to be zero-emission. The current vehicle charging network will be extended from 175 to 300 stations over the next 2 years, including 3 quick charge stations. Monaco will also continue to offer discounts to residents willing to buy electric vehicles and will develop further incentives for zero emission car users. A memorandum of understanding has been signed with Mitsubishi for a fleet of i MiEV test cars that will be used by local services such as the post office, telecom company, parking services, and even Monte Carlo SBM hotels and casinos. Daily use of the cars will be monitored so that any technical problems can be ironed out, and in order to investigate the vehicle’s market potential.